Beadfest 2012 was terrific! I always look forward to August, and Beadfest Philadelphia. I am fortunate to live just an hour away, and I try to attend each year. This year, I went on Friday, and while there were crowds everywhere, I was happy to be able to chat with some artists while making my purchases. That is always fun. I love to talk with them about their designs, and find interesting information about their whole process. I love that personal contact. It has so much more meaning when creating a design using pieces that were handcrafted by someone I know. There are many very talented artists out there, here are a few of my designs created from their work. I love to create one of a kind designs, and I am very happy with the results. So, thank you to the amazing artists sharing your work and your stories. Here are my designs using beads by artists of Beads of Clay that are shown below: Joan Miller Porcelain, Jenny Davies-Reazor, and White Clover Kiln. 'hope to see you all next year. I am so delighted to be a part of Erin's Simple Truths Celebration. She is an amazing artist. I am fortunate to have a few of her pieces, and especially excited about having one that is custom made. My favorite quote is "Seize The Day". So, naturally, I had Erin make one of those for me. I kept it rather plain and simple, and I love that I can wear it with anything, any color, any time I want. I also own an old Woodsy Owl, and a whimsical Motley Owl. 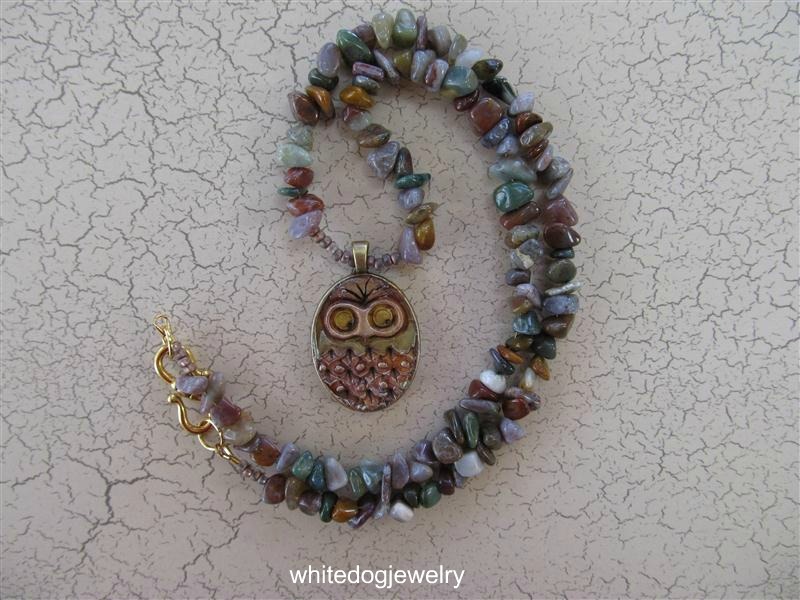 Pictured are my designs, in keeping with a nature theme, designed with natural gemstones, highlighted by those wise, old owls. I was honored to be the Designer Highlight in Bead Trends Magazine June 2012. 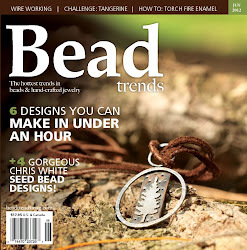 I have been published in Bead Trends numerous times in the past two years. It was a great honor and privilege to be asked to be Designer Highlight. The focus was to be on my favorite type of beading, bead weaving, with a romantic theme for June. It was great fun to work on these designs, and even more fun to see it in print. Bead Trends did a beautiful job in photographing my work. What a thrill! Thank You Bead Trends! I encourage everyone to give it a try. Submit your creations and join in the fun. I was fortunate to win one of the Motley Owls by Erin Prais-Hintz in the blog hop challenge hosted by Lorelei. Erin says the Motley Owls that she creates "...wink their eyes at their more somber cousins and pull pranks with a hint of a smile". I think my Motley Owl is thinking twice about that statement. Take a look at the eyes, and then at the two birds in the necklace design. Is my Motley Owl able to take on the two of them??? I created this design wanting to keep a nature theme. I used Fancy Jasper gemstone chips along with Petersite gemstone beads, and two whimsical brass birds in an asymmetrical design. It's fun and funky, perfect for a fun day out with friends. I love the Motley Owls, you cannot help but smile when you see them. I love too, that they all have their own personalities. Thanks Erin for sharing your talents and whimsical designs with us. Thank you Lorelei, it's been great fun. I'm looking forward to see what the others have created. 'just saw on Facebook that Nicole @ Beadwright is offering a give-a-way of Sherry Serafini's new book Sensational Bead Embroidery....check it out. She just became a reviewer for Lark's books. I am a Bucks County PA artisan, creating unique, one of a kind jewelry designs. I have a classic style with a contemporary twist. Many of my designs have been published in Bead Trends magazine. I am the Designer Highlight in Bead Trends June 2012 Issue.